My boys love comic book superheroes. We watch Ultimate Spider-Man, Avengers: Earth’s Mightiest Heroes, and other shows featuring super-powered individuals fighting evil. With the Avengers movie in theatres, you’d think I’d be dragging them to see it. Unfortunately, the live action Avengers movie (like the Hulk, Iron Man, Thor, and Captain America movies before them) are a bit too much for an 8 year old and a 4 year old. 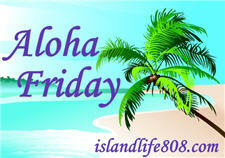 My Aloha Friday question for today is: Have you ever gone to see a movie all by yourself? There’s no reason why you shouldn’t go alone. Sit, watch, snack and enjoy! Did I ever say I would not go with you? Finding a time for both of us to go is more of the issue. Nope. I’ve never gone to a movie alone. I can’t drive, so that hinders my movie going to movies I can see WITH people. Otherwise there are tons of movies I WOULD have seen alone. Most of them horror movies, since my hubby doesn’t seem to like them.